Anna Kisselgoff has written the obituary below about the life of Felix Fibich. 96 years old. My! I have always enjoyed Ms. Kisselgoff’s writing about dance. Perhaps I turn to it because my sister has been a dancer. In 1988, at age 76, he played in a Joseph Papp production…so, he was a great example of productive aging & the artist as the muse. Felix Fibich and Judith Berg in Paris in 1949. They eventually moved to New York and specialized in Jewish dance traditions. Felix Fibich, a Polish-born modern dancer, choreographer and teacher who specialized in dances drawn from the Jewish heritage of Eastern Europe, died on March 20 in Manhattan. He was 96. The American dance historian Judith Brin Ingber, a friend, confirmed the death. 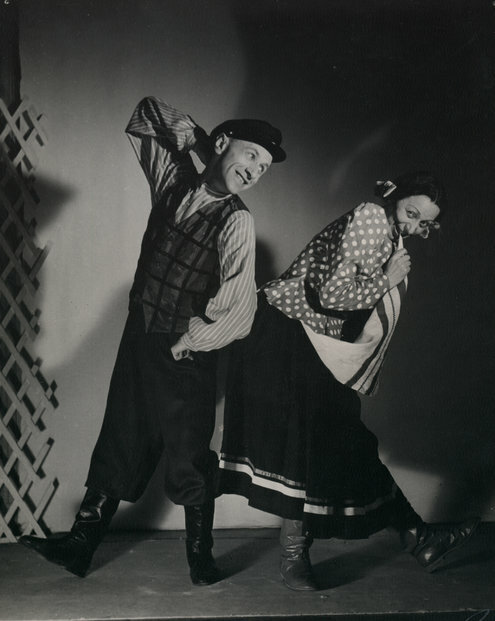 As a young actor in Poland’s Yiddish theater troupes, Mr. Fibich observed a wide range of expressive gestures and dances in Jewish communities. After moving to the United States in 1950, he and Judith Berg, his wife and first dance teacher, became known through concerts and workshops as experts in theatricalizing Jewish dance traditions. Mr. Fibich (pronounced FEE-bish) said their repertory came out of Hasidic sources, non-Hasidic folk songs, Yiddish literature and biblical themes. He went back to acting in later years, appearing in Broadway productions and films and on television. In 1997, he choreographed part of “Planet Lulu,” an avant-garde Belgian production with décor by the performance artist Marina Abramovic, and toured with it. He also appeared in a commercial for a cellphone company, teaching dance to football players. Mr. Fibich was born Fajwel Goldblatin on Aug. 5, 1917, in Warsaw, where his mother owned a restaurant and his father was a cantor. He adopted Fibich, his maternal grandmother’s surname, as his professional name. Although his parents spoke Yiddish, they spoke Polish to their son, and he attended a Polish-language high school. At the time, internationally known Yiddish theater companies were thriving in Poland, Lithuania, the Soviet Union and New York, and the young Mr. Fibich aspired to act in one. Before he could audition, however, he had to learn Yiddish with a tutor, he told Ms. Ingber in an interview for her book “Seeing Israeli and Jewish Dance” (2011). Mr. Fibich particularly yearned to join Michael Weichart’s Yung-teater(Young Theater) in Warsaw. He did, and in 1936 met Ms. Berg, who was choreographing the troupe’s production of “Wozzeck.” Ms. Berg, a student of the German Expressionist dance pioneer Mary Wigman, felt he needed dance training and became his teacher. After Poland was invaded by the Germans, Mr. Fibich and his parents were sent to the Warsaw ghetto. His parents died in the Holocaust, but Mr. Fibich escaped in 1940 while on a work detail and traveled to Soviet-controlled Bialystok. There he found Ms. Berg working for a Yiddish comic revue. They toured the Soviet Union with the troupe and married in Turkmenistan before returning to Poland in 1946. In 1949, they performed in Paris before moving to New York the next year. A sea change occurred after he took a course with the American modern-dance pioneer Doris Humphrey. Mr. Fibich felt his intuitive approach to choreography would benefit from her movement analysis and be the key to maintaining a defined style. Ms. Berg died in 1992. Mr. Fibich is survived by his companion, Jaya Pulami.